'The end of the world. Let me tell you about the end of the world. It happened fifty years ago. Maybe a hundred. And since then, it's been lovely. I mean it. Nobody tries to bother you. You can relax. You know what? I like the end of the world' (p. 183). Thomas M. Disch's 334 is a labyrinthine, perplexing but engrossing work of exceptional quality. Despite my own enthusiasm for it, I can see that its coarser moments (there a number of truly vulgar metaphors and challenging thematic allusions) would distress or dishearten many readers, and almost certainly debarred the work from being honoured with one of the major traditional SF awards within its own historic present in the early 1970s, although it was a Nebula nominee in 1974. It focuses on the lives of a dozen or so individuals who are either residents of, or in some way associated with, 334 East 11th Street, Manhattan (p. 10), at the end of the first quarter of the twenty-first century. Analyses of apartment block fiction invariably defer to Georges Perec's Life: A User's Manual, but Disch's work (which predates Perec's novel by some fourteen years) should rightly oust the latter for this mantle, in my opinion. Structurally, 334 is extremely challenging. 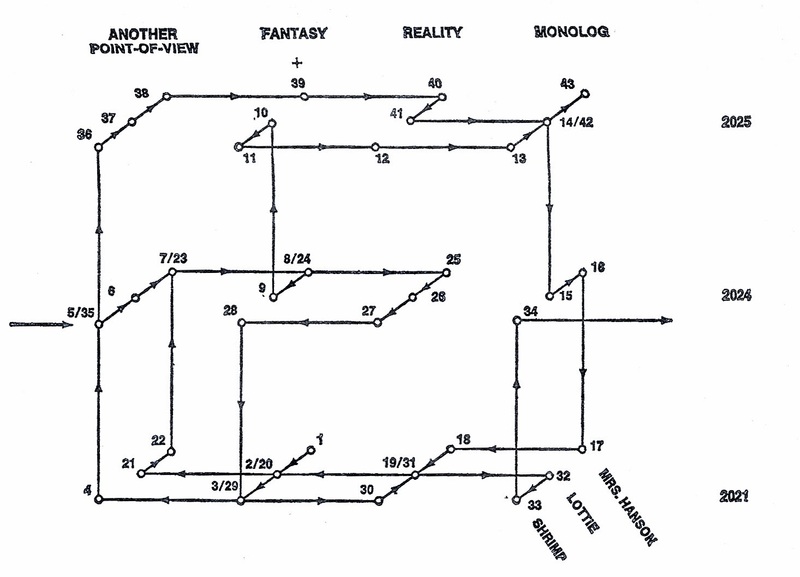 The work emanates from the first five chapters and coalesces in the eponymous sixth chapter, which consists of forty-three vignettes, envisaged by Disch in the page shot attached as offering intersecting points of view and monologues both fantastical and realistic. It is extraordinarily ambitious and the for the most part successful, but this is not a traditional work with a beginning, middle and end. As a consequence, 334 may be characterized as being as fragmentary, confusing, contradictory and wholly engaging as life itself. The narrative framework allows Disch's disparate collection of short stories to offer multiple perspectives on the grim near-future of his imagination. An ageing nation, twenty-first century America enforces population control, and the majority of its citizens live in poverty in a decaying urban environment. It is inferred (e.g. p. 159) that the global economy has collapsed, toppling liberal democracy in the process. America is now run by MODICUM, a centrally controlled state bureau. The new society that has arisen from the ashes of the old is stable but anodyne and grey, stripped of vitality and potential. Its citizens look back upon the hope that the past seemed to offer with envy in the midst of the chaotic, atavistic conditions that they now endure. Museums feature simulacra of supermarkets, and allow visitors to walk up and down the aisles with trolleys to recreate the experience of shopping without actually being able to buy anything, as all the goods are fake. The blank joylessness of life is palliated by the narcotic haze facilitated by morbehanine, which is ingested in several different forms for different purposes: 'modified by narcotising agents, it was marketed as Oraline; with caffeine it became Koffee and Yes; with tranquillisers, Fadeout. In its crude form it was used only by the intellectual elite who practised Historical Analysis' (p. 94), a sort of living historical interaction which presupposes sufficient knowledge to be able to conjure up a useful dream-state within which to test historical hypotheses. Over thirty-five years on from the date of its composition, 334 is a fascinating text to engage with in our own historical present, as the world economy lists crazily in wild economic waters: 'no one sees his own culture declining till around the age of forty, and then everyone does... But things had been going downhill for two hundred years... or three or four' (p. 99). The implicit argument here is that democracy was never an evolutionary end-point for societal and economic arrangements. Disch's rendering of a possible alternative is hardly an encouraging one, but it is easy to read 334 as a collective plea for humanity to let go of the rising balloon it clings on to with a faltering grasp, acknowledge the impossibility of perpetuating the dream-state that late capitalism engenders in those that fall under its malign, narcotizing influence and have the courage to accept that novel systems of social and economic arrangements are required. 'Heaven. What is heaven? Heaven is a supermarket [...] And I would just go down the aisles with my big cart in a kind of trance, the way they say the housewives did then, without thinking what any of it was going to cost. Without thinking. A.D. Nineteen-fifty-three - you're right, that's heaven [...] That's the trouble with heaven. You say something that sounds nice, but then you think, would you really want it a second time? A third time? Like your highway, it would be great once. And then? What then? (pp. 223-4). Creativeness is the ability to see relationships where none exist (p. 29). Was this one scheduled to be released as an SF Masterwork at one stage, along with "Camp Concentration"? Come to think of it, I haven't seen much coming out under the SF Masterworks banner in quite some time. I'm reading "The Fall Of Hyperion" at the moment - how could I not, after the way "Hyperion" ended? I've got "334" on my shelf, so perhaps that will be my next read. I'll save your review until then. Yes, to the best of my knowledge both Camp Concentration and 334 were scheduled to be published as SFMWs a while back, but never materialized. I suspect this was a p/b rights issue; perhaps this will be resolved as/if more of the case-bound editions which circumvented the restrictions appear. The only one to be published to date is of course Dune; the three I mentioned in the revised 'Welcome' post a couple of months back now appear to have had their publication dates pushed back to 2010 (according to the Orion online catalogue), so who knows? My last couple of reviews have drifted off the strict SFMW and FMW format to enable me to review award winners and entries from the 'Future Classics' series, as well as the odd 'House Pick' which falls into no other category, but which I read and enjoyed and have something to wibble about. 334 is the first of these. I have started an entry from the SFMW series as part of my preparation for 1st November and this year's NaNoWriMo. My return to the original premise of this blog so soon after having purposefully deformed it a bit is largely a cosequence of my disappointment with Lois McMaster Bujold's The Vor Game, which I am reading for the 'Hugo Winners' strand. How it won is beyond me, but I'll persevere in order to be able to review it before too long. So: back to the main series, I think, but there will continue to be plenty of bends in the road!